Ask your SuperValu butcher to bone out the lamb loins for you. 3. Transfer the lamb to the oven in the frying pan and roast for about 10 minutes, depending on how you like it cooked. If you like your lamb well done, leave it in for a further 6 minutes. Take the pan from the oven and set aside for about 10 minutes, loosely covered with foil to keep it warm. 4. Meanwhile, heat the remaining tablespoon of oil in a separate frying pan set over a medium heat. Add the onion and cook for about 5 minutes, then add the remaining rosemary along with the honey and peas and bring to the boil, then remove from the heat. 5. 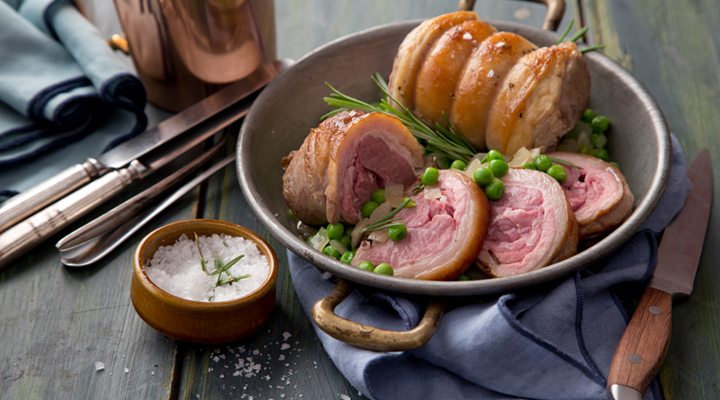 To serve, cut the lamb into slices and divide between four plates, then pour over the honey and peas. TIP You could use vegetable stock instead of honey.